But enough spruiking — to the film. 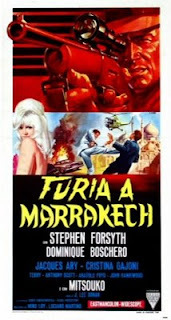 The film opens in a Marrakesh, and Ahmed, a plump, balding, underling for a top secret evil organization is in his room with the beautiful Monique Geiberville (Doninique Boschero). Before they settle down to a bit of horizontal folk dancing, Monique pours them a drink. What Ahmed doesn’t see, is that she pours a sleeping powder into his drink. He passes out, and she removes a key chain from his wrist. She goes to the safe; opens it; takes out a wad of bank notes and replaces it with a stack of blanks. The following day, the cream of the criminal underworld arrive in Marrakesh to attend a meeting headed by Carl Koontz, who is the head of the un-named evil organization. He explains that his organization has discovered the location of the bunker where Adolph Hitler hid the bulk of the Nazi treasure. Included in this treasure were billions in counterfeit US dollars and UK Sterling. This counterfeit is indistinguishable from real money. Hitler’s plan was to destabilize America and Britain’s economy by unloading the counterfeit money. This never happened and the money has lay hidden ever since. Now Herr Koontz is planning to go ahead with the scheme. He intends to supply to the criminal heads gathered before him, vast amounts of counterfeit — charging them only 30% of the face value, Then at a designated time, all around the world, the criminals will off load the counterfeit, exchanging it for other, safer, currencies. As the money is indistinguishable for the real thing, the operation is risk free and they will immediately show a 70% profit. It all sounds good to the criminals, but they want proof. Ahmed goes to the safe to get some samples of the fake cash to show the criminals, only to find that the blanks left by Monique remain. Ahmed is given a good beating for his stupidity, and it is ascertained that Monique would have fled to the United States. And go to the United States, she did. When we next meet Monique she is in New York at a fair and she is going from stall to stall and passing off her counterfeit notes — exchanging it for smaller denominations in legal tender. However, her suspicious behavior is noted by a CIA agent who happens to be at the fair. He follows her and films her with a micro camera — but does not bring her into custody. Later, the CIA examine some of the notes that she passed (or, more correctly, sent them to the treasury for analysis). The results are that they are legal tender (the copies are pretty damn good!). But what makes them suspicious, is that the notes are all new (uncirculated), but are from a batch printed in 1942. The CIA believe that Monique Geiberville and her mysterious money are worth investigating. The man chosen for the mission is Bob Dixon (Stephen Forsyth). When we meet Dixon he is undertaking training in Guadeloupe. Before he has even finished the course, he is called back to the US and then sent on the mission, This begins by following Monique. Things take a strange turn, when two goons arrive and kidnap Monique. Dixon tries to intervene but is knocked unconscious for his trouble. But before blacking out, he heard them mention Marrakesh. So that’s where he goes next. Upon arrival he teams up with a British investigator, Alexander Keene (Jacques Ary) of Special Branch to get to the bottom of the counterfeit scheme. Unfortunately Furia a Marrekech, during the middle section, slows down to crawling pace – these being the scenes in Marrakesh. There’s some nice location footage and some belly dancing, but the plot takes it’s time moving forward. However, when the film moves to the Swiss Alps for the final thirty minutes, the film kicks into gear, and becomes far more interesting and entertaining. I wouldn’t quite call it, ‘Fury in Switzerland’, but the film presents a good healthy dose of Eurospy action. And despite any misgivings I may have about the pacing of this film, it presents a few classic spy film tropes. These sequences are not groundbreaking by any stretch of the imagination, but they are good fun. Being released in 1966, Furia a Marrakech featured a stylish skiing sequences two years before On Her Majesty’s Secret Service and Double Man hit the slopes. The film also used latex rubber masks, like those used in many Krimi and Giallo films, and of course, the recent Mission Impossible films. It also features a cross-dressing Asian character — which may have have been borrowed from Lindsay Shonteff’s The Second Best Secret Agent in the Whole Wide World (1965). In fact, Shonteff himself recycled it once again in No. 1: Licensed to Love and Kill (1979) — but here is given a neat twist. Like many films with Morrocco as a setting, this film owes a small amount of debt to Alfred Hitchcock’s 1956 version of The Man Who Knew Too Much. Unlike Our Man in Marrakesh, or Marie Chantal Vs. Dr. Kha, this film is not so much of a homage, but none-the-less certain scenes in clubs and in the markets seem to echo the great master’s work. All in all though, Furia a Marrakech is an interesting diversion, and well worth a look, but I wouldn’t call it a top tier Eurospy production. Most of the movie’s failing fall onto Stephen Forsyth as the hero Bob Dixon. Dixon is basically a student spy — just out of training, which accounts for his youthful appearance. But by the same token, it’s his youthfulness which fails to sell him as a slick secret agent – well, in my mind at least. This is perfectly summed up in the scene where he tries to seduce Greta, the number one hench-woman, played by Cristina Gajoni. As he continually tries to seduce her, she pushes him away – but still leads him into a simple trap. Connery and co. would never have let this happen to them. Funnily, if you look at the poster artwork, it adds a good fifteen years to Forsyth, making him look like a seasoned professional, rather than a young whipper-snapper. I’m sorry to hear you didn’t like this one more, David. I really loved it! I also liked having a young, less accomplished Eurospy hero fresh out of spy school (or not even graduated!). I thought it was a fresh alternative to the usual world-weary master-of-all-trades hero in the Bond/Flint mode. It was interesting to see all the mistakes Dixon made. It’s a pleasure, as always, though, to read your take on it all!